A Zuumer is a three wheeled electric vehicle which resembles a scooter. The suspension provides a comfortable ride with good stability - with a motion similar to "carving like a skateboarder"
Motorised scooters or pedal cycles with a maximum power output not greater than 200 watts fall into the AB vehicle category (Pedal assisted cycles) in the National Standards (ADRs) and are not subject to the Australian Design Rules. However, they must still have an Import Approval, before they can be imported into Australia. Complete scooters over 200w are classed as motor vehicles and require a permit from the Australian Department of Transport. 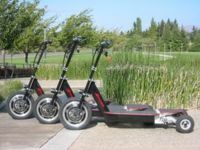 A current restriction on the the granting of electric scooter import permits is that they are 200w or under. This page was last modified 09:11, 18 March 2010.